13% less tip end weight equals less squirt. A unique combination of materials keeps the strength high while reducing the weight near the tip. Reduced cue ball squirt means less compensation, which makes you more accurate. 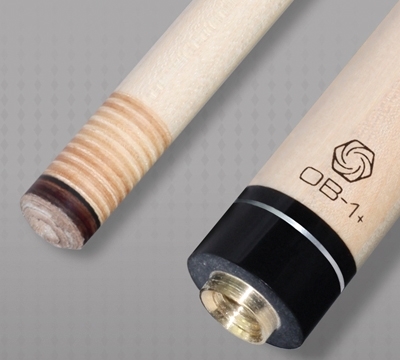 The OB Plus shafts have a good balance between flexibility and stiffness. You get the extra cue ball spin without losing consistency. OB shafts are radially laminated. This means you don't have to rotate the shaft to a mark before every shot because it performs the same in all directions. The patented OB Plus shafts are constructed using SR6+ construction. They begin with 6 solid pieces of hard rock maple, and each segment is machined in a way that cuts away most of the stress that is found in maple which means the shafts are built straight and stay straight. Another big advantage of SR6+ construction is a more radially consistent shaft which means that you will play more consistent pool with an OB Plus shaft on your cue. In addition to an ideal mix of flexibility and stiffness, the core of the OB Plus shafts are composed of vibration-dampening material. The highly engineered structure with the vibration-dampening core results in exceptional feel.